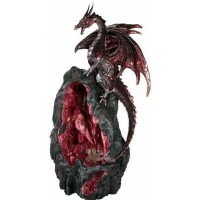 A winged dragon perches upon a rocky outcropping flowing with smoke in this gorgeous backflow incense burner. Put a cone of incense inside this tower and watch the smoke curl down the rocky face. 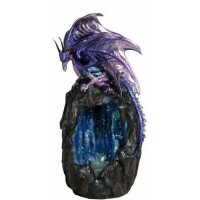 Gray stone look cold cast resin dragon incense tower is 8 inches tall. Item Number: PT-10527 | Approximate Size (Inches): 5.50 wide x 4.25 deep x 8.00 high | Approximate Shipping Weight: 2.00 lbs.